HTML5 Animations with Adobe Edge | F.A.T. Oh, glory goddamned hallelujah. Another annoying-assed, probably unblockable advertising delivery system from the Bloatware Kings. Thanks so very goddamn’ much, Adobe. At least blocking Flash ads was pretty straightforward. Here’s hoping the AdblockPlus upgrade comes soon — very soon. Hey Tobi, great animation! 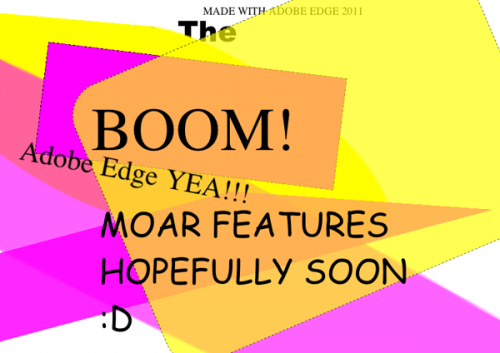 Are you available for teaching Adobe Edge workshops? Peter Butler: good job and fcuk yeah dead space!!! Haha Jean! Thanks dude xD!